Beginning May 23, 2017 at 4:00 am until August 1, 2017 at 6:00 pm, the heating water in Pacific Hall will be shut down. The reason for this request is to permanently remove portions of the hydronic piping, as well as re-routing of piping for radiators that will remain in service. This will affect the building’s heating water. Lower Level – complete piping and radiator demo. 1st floor – complete piping and radiator demo. 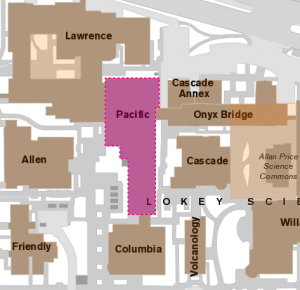 2nd floor – 6 Labs will remain in service, those within the construction area will be removed. 3rd floor – Radiators on the south end of Pacific Hall will be taken out of service, but will remain in place. Work will be performed by Andersen Construction & S2 Mechanical. For questions or concerns about how this may impact your area, contact Jen Miley, Campus Planning and Facilities Management (CPFM) Design and Construction at 346-1530.